A big tag team match featuring former ECW talent is set for Impact’s United We Stand event during WrestleMania weekend. 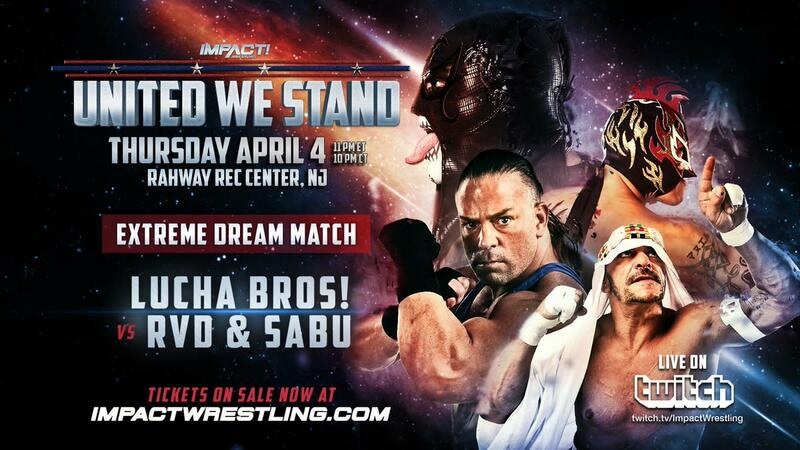 Impact announced tonight that Rob Van Dam and Sabu will challenge Penta El 0 M and Rey Fenix at their United We Stand event on April 4. The Lucha Bros are the current Impact tag team champions, with tonight's episode of Impact showing the title win, but it isn't clear if the titles will be on the line for this match. According to Cagematch, the last time Rob Van Dam and Sabu teamed up together was back in 2015 when they defeated the Hardy Boyz at the 2015 WrestleCon Supershow. They also teamed up on an episode of Impact Wrestling in 2010, when they lost to Beer Money. Tickets are on sale now. It will take place at the Rahway Rec Center in Rahway, New Jersey, and it will stream live on Twitch.